Carvarvon House is a large well-proportioned square shaped solid detached house standing a few yards back from Long Acre and with a long garden. It is not of overtly 'fancy' construction but there are some attractive embellishments to make it the more impressive. The land on which it stands was, as is common in Bingham, once part of the Shelford Estate belonging to the Earls of Chesterfield and then, through a marriage settlement, to the Earls of Carnarvon. The land was part of the homestead of Walkers Farm, which stretched between Long Acre and The Banks, almost to Tithby Road and possibly as far as the orchards that used to be on the west side of Fisher Lane. As the Walkers turned to building, plots of land were used for 'infilling' for building houses over the turn of the nineteenth century. The Abstract of Title of the Earl of Carnarvon recites a marriage settlement whereby The 8th Earl of Chesterfield, George Philip Stanhope settled the land on the 4th Earl of Carnarvon in 1874, in anticipation of his forthcoming marriage to Evelyn, sister of the 7th earl and daughter of the 6th Earl of Chesterfield. The 7th Earl died without male hairs so the title and estates had passed to the 8th Earl via a separate line going back as far as the 1st Earl. (See 1 Market Place for details). A missing lease probably dated 29th September 1900 (see below) would have referred to a 99-year lease of the land for the lessee to build a house upon. As with the leases for 9 Newgate Street and for Cromwell House in Station Street, it would probably have specified a minimum sum to be spent on the new house. This may well have been £350, the sum for which it had to be insured under the terms of the lease noted below. There would also have been a date by which it was to be erected. The first indenture we have is dated 30th January 1901. The abstract was prepared in 1900, which is why it looks as though there is one deed missing from the collection. The 1901 deed sets the annual rent of £3-2-6d. It is between the (5th) Earl of Carnarvon and Frederick Taylor, a Grocer, of Bingham. He is recorded at living at the Gables in 1908 and Porchester Terrace in 1920. We know from some documents from 24 Newgate Street that he also leased land on the south side of the Banks from the Earl in 1898. The plan is attached to the 1901 lease, and clearly shows the extent of the Earl's holding at that time. It shows that plot number 199 was split into two. Indeed the eastern half was further divided to accommodate the semi-detached houses number 8 and 10. 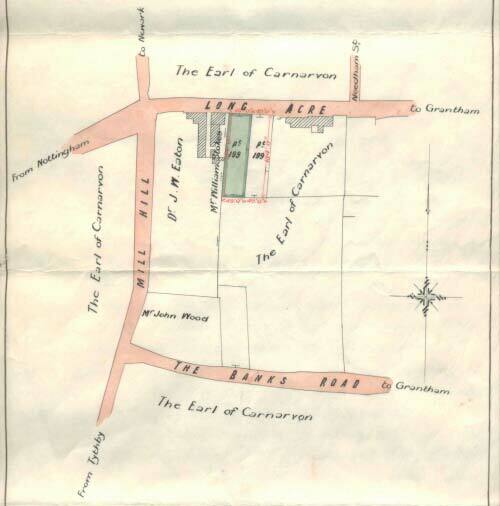 The plot shaded green is Carnarvon House. It is more than likely that the parcels of land for these houses were part of the larger Walkers Farm, later Walkers Builders Yard where Walkers Close is now. Number 4 was independently owned. A Bingham resident whose father worked for him remembers that James Walker built the houses opposite. Victoria Villa has a date stone for 1887. The land for these houses is shown as owned by the earl so presumably they also would have been leasehold – one wonders if the freeholds were also sold in 1920. The 1901 indenture records that the plot of land measures 1000 square yards (it still does) and that a dwelling house already exists. It also refers to the unexpired portion of a 99-year lease dated 29th September 1900. Thus the house would seem to have been built between September 1900 and 30 January 1901. Bingham library has a photograph taken in 1900 of no 4 Long Acre, next door, which shows the garden wall of Carnarvon House. There is a small wicket gate halfway along the wall but no driveway gate. There are several interesting covenants to the lease. The Earl covenants to leave Taylor to 'quietly enjoy the demised premises' so long as he adheres to all his covenants. Taylor covenants to adhere to the conditions in the schedule attached. Many of these are the equivalent of planning requirements in today's terms and include such things as regular painting of exterior (in original colours) and interior, payment of any land taxes, not to add any extra buildings, and not to 'use the premises as a factory, workshop, public house, club, brew house or for sale of alcoholic liquors or for any noisome noxious noisy or offensive trade or business'. This was a standard condition imposed by the Earl on other properties for which we have examined deeds. Taylor also had to insure the property for £350 (which gives a clue to the likely minimum cost of the house to be erected, see above) with a named insurer - Alliance. He also had to give notice within 14 days of the transfer of lease and pay one guinea to the Earl for this. Two letters doing just this are in the bundle of deeds. The Earl could repossess the property if he defaulted on the payment of ground rent. In 1903 Taylor assigned the lease to Miss Sarah Lascett for the remainder of the 99-year term from 29 September 1902; the required letter giving notice to Lord Carnarvon is included in the bundle of deeds. Sarah is described as a widow of Radcliffe Road, West Bridgford. She paid £465. Also on 30 July she took a mortgage on the property from William Marriott, a farmer of Aslockton, for £300 at 4%. The mortgage document was witnessed by C Cecil Lucas, 'clerk to Mssrs Richard Marriott, Solicitors, Nottingham' - perhaps his son. When Taylor sold to Sarah Lascett he seems to have moved to The Gables at the corner of Fosters Lane and Long Acre East. It may be he only developed the house to sell, and either lived there for a year or not at all. The Gables was built in 1903, so he may well have moved from Carnarvon House quite quickly. On 11 November 1905 Miss Lascett assigned the remainder of the lease (again the letter to Lord Carnarvon is included in the deeds bundle) to Mrs Amelia Bridger, a widow. Lascett had moved to Addison Street, Nottingham and Bridger came from Forest Road, Nottingham. Mrs Bridger paid £460 for the house, without apparently needing a mortgage, of which £300 paid off the principal owing by Miss Lascett to William Marriott. These papers make the first reference to the house as 'Carnarvon House', so perhaps Miss Lascett bestowed the name. In her will of 3 May 1899 Mrs Bridger is described as 'wife of James Bridger, gentleman, so perhaps this is an indication of why she did not need a mortgage. She died on 21 October 1909 but her executors (including the son Samuel Campion Bridger) did not sell until 1918. He continued to live at his mother's house in Forest Road and was in business as a gentleman's outfitters on Radford Road, Nottingham. Samuel's business went into liquidation and clearly he had to sell Carnarvon House along with his other assets. An indenture of 24 August 1918 (which was a standard form with gaps completed for the particular case) transferred his assets, including all real and personal estate, to his accountants as trustees. The only exception was 'necessary wearing apparel and bedding of the debtor and his family not exceeding five pounds in value'. So he is bankrupt. If he were lucky, any 'surplus after settling the estate would go to the debtor after paying creditors and expenses'. The indenture gave the trustee power to make subsistence payments to the debtor. On 7 December 1918 the Trustees on Samuel's behalf assigned the lease to Thomas G Bowstead, a farmer of Oxton, to £550. Again the deeds have the letter to the earl's solicitors notifying the assignment. Up to now the property had been leasehold, with the lessees paying ground rent to the Earl of Carnarvon. On June 22 1920 the Earl sold the freehold to George Bowstead for £78-2-6d. The Earl sold the freehold of several other properties in Bingham (number 8 next door, for instance) in 1920. At the time he was heavily involved in archaeological excavations in Egypt with Howard Carter, finding the tomb of Tutankhamen in 1923. He was probably short of cash and perhaps selling freeholds was a means of raising some finance for the work. As in the other cases the Earl reserved the mineral rights below 600 feet and had full power to do 'whatever is necessary for mining and working and carrying away the same by underground workings doing as little damage as possible and paying compensation'. A schedule to the freehold conveyance rather suggests that there was not a lease before the 1901 but that the 1901 lease was signed after the 99-year term had started. There may have been an agreement to lease once the house was built - as there was for 9 Newgate Street in similar circumstances. The Kellys 1922 directory shows Bowstead as resident at Carnarvon House. Maybe he retired there. Bowstead died on February 1937 and on 18 June his executors conveyed the property to Mrs Lizzie Burton of The Firs, Foston, for £800. She is described as 'wife of George Burton' and it is noted that 'the consideration of £800 was paid by the purchase out of her separate estate (i.e. it was not her husband's money). Lizzie Burton died in 1966, 'late of Carnarvon House', so she had lived there and her executors sold to John Anthony Leach, of the Caravan, Main Street, Coddington, for £2800. He was later described as a 'civil engineer' in a mortgage agreement with The Halifax Building Society. The present owners purchased from Mr Leach about 1990.